That's kind of how it felt out at Chickahominy this morning. Having been quite curious about the conditions of the reservoir after reports of it being quite muddy the last couple of weeks, and from the number of calls I've received the past few days inquiring about the status there, I ventured out. I wasn't the only one. Nearly 2 dozen anglers were searching for fish, a half dozen of them in boats, the remainder surrounding the lake. The good news is that the water level is up as high as I have seen it for several years. In fact, another 3-4 feet and the rock points would be underwater. Clarity still remains poor. There is perhaps 8 inches of visibility. Regarding fishing, I will admit I only had a fly in the water for an hour, and no success in my attempts. I did see one fish break the surface. Other than that, nothing to report regarding fish, as no one seemed to be having success. I did hear a couple of gentlemen in a boat comment say that there didn't appear to be any fish "up in the 6 to 7 feet of water", and noticed they and others in another boat going through their tackle boxes for different gear. Other than some rain forecast for Saturday, then again late next week, the upcoming weather looks decent, which will hopefully lead to decreased turbidity. I will check on it again next week and provide an update. Beulah: As I write this, Beulah is at 87% full and rising. No reports. Krumbo: No recent reports. Only thing I have heard is it's been fair with no large fish being caught yet. Blitzen: The river has been running in the 300-500 cfs range, and could see another uptick as this warm weather sticks around for a couple of days. 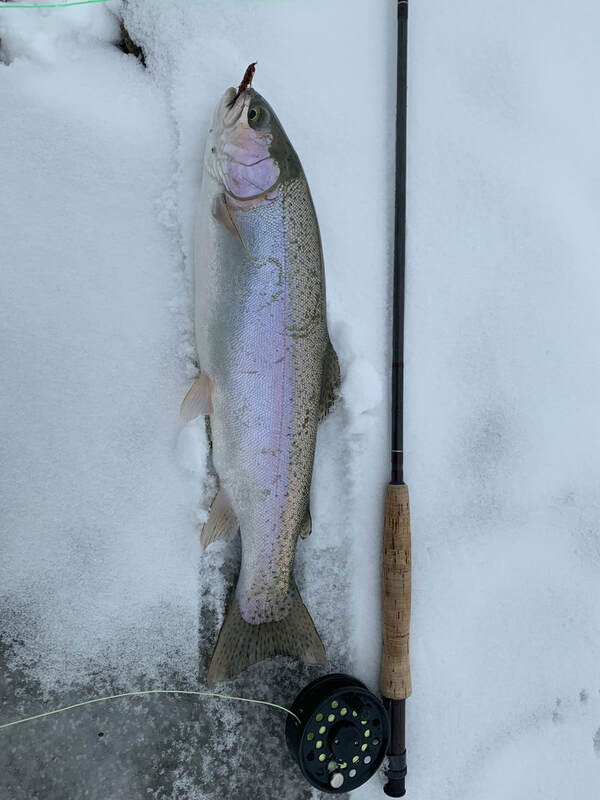 For best results, wait for it to be dropping on the south side of 200 cfs, give or take. Swung into Chickahominy for a water check on the way by yesterday and was pleasantly surprised to see that the water level has come up considerably. Earlier, there was just over one dock section afloat at the ramp, while currently four sections are usable. And with the moisture we received last night (an inch of snow here in town, but just looks wet on the Riley TripCheck cam) and what's forecast, it should rise more. With the increase of water and spring winds, the water is very off color. I've had several calls reporting that fishing really slowed down to turned off once visibility decreased. Expect turbid waters until we have several days of calm. Reports are that Krumbo is fishing fair, with most fish in the mid-teens. No reports from the Blitzen, which currently is flowing less each day (226 cfs right now) with maximum flow around midnight. Expect high flows again with warmer weather. It was Hot, It was cold! "This is as good as it gets!". That was the feeling after the first 45 minutes at Chickahominy yesterday as we braved the sub-freezing temps, snapped ice out of the guides, and warmed our fingers between fish. Then things slowed down, but stayed interesting. Frequent trips to a warming fire, chased with some hot cocoa, kept the blood flowing to the extremities. 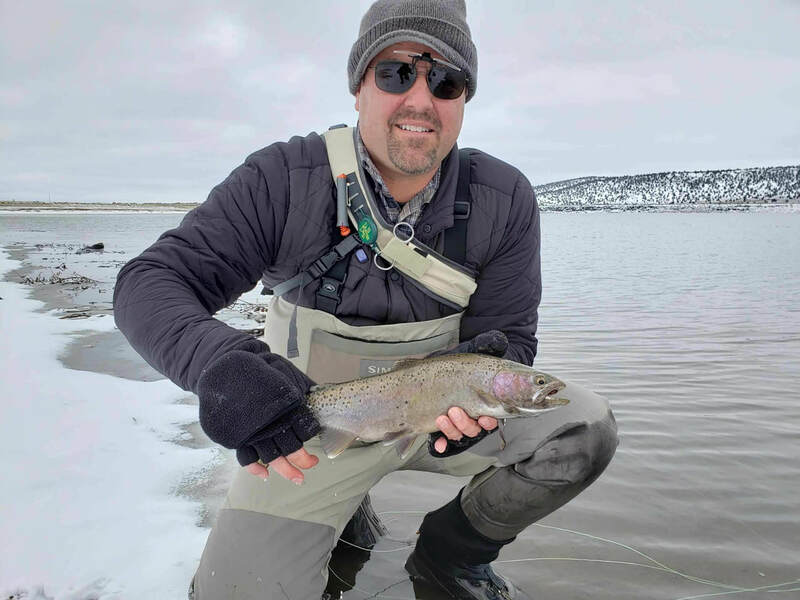 When the day was called after a couple of hours of pounding a small section of the reservoir, nearly a dozen fish to 19" had been brought to hand, with close to another half dozen benefiting from a long line release. The fish are strong, have a liking for a slowly stripped leech (you know which pattern!) or Prince, and return a subtle but solid take for the offering. It's gonna be a good spring, indeed! Well, there hasn't been much to report on for a few months due to water bodies froze up or very low. I did hear once that the Blitzen was fishing "slow" a month ago, but no real data to back that up. And, I've been focused on coyotes and bobcat with spare moments since November. But now it's time to think FISHING! I've had several inquiries regarding when I think CHICKAHOMINY will be ice free. Recent weather in the region has been rather odd, with the area around Burns being more mild than in Central Oregon. Even the Hampton and Brothers areas have been much, much colder than Burns. So, I was quite surprised to read on a popular fishing/hunting website just minutes ago that CHICKAHOMINY IS 2/3 ICE FREE!! I will stop in and check it out tomorrow on my way to Bend, and possibly have a fishing report by weekend's end. If you see no edits or additions to this by Saturday, then I found that it is, indeed, showing some open water. This is more of a public service announcement than a fishing report! With the recent high temperatures, the water temp of the Blitzen continues to increase. With flows now below 30 cfs, the stream has seen temps hit the 80 degree mark and higher this past week. Please respect the fish in this system and let them be until the days and nights cool off this fall. Redbands are tough fish, however, can't take a lot of stress in this water. Thank you! With the air getting warmer, so are our water bodies. I've had several inquiries about the Blitzen the past week. With the exception of the thunder storms pushing the stream up over 200 cfs a couple of times, the river is flowing in the mid-80 cfs range. Temperatures are mid- to upper 50's, to just below 70 degrees daytime, and rising with each passing day. If the trend continues, watch for warnings regarding stressed fish before too long. And if you fish there, again....load up on mosquito repellant. No recent reports from Chickahominy, however, I know some nice fish were caught there last week. Anticipate algae. Beulah is currently at 45% full, while Warm Springs is 53% this evening. No recent reports. 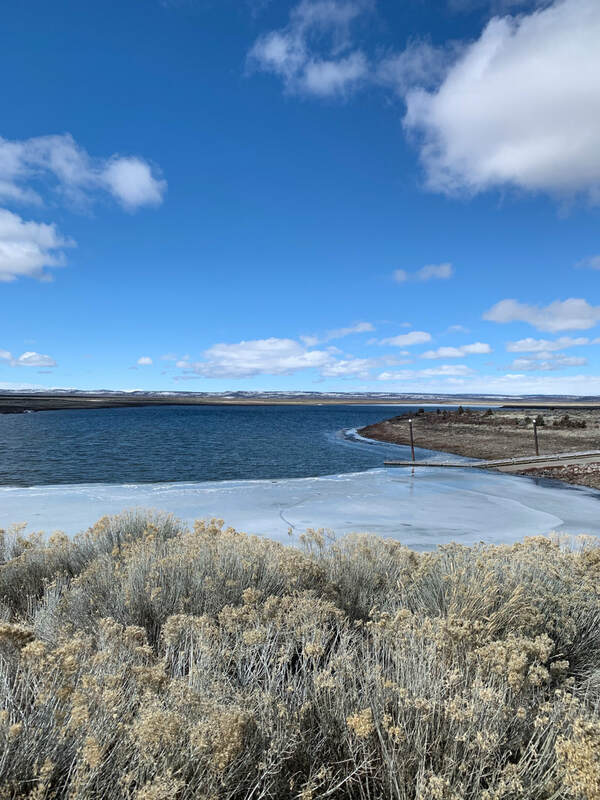 Now a few days into June, Harney County sees temps in the 70's and 80's in the forecast for the next couple of weeks, with only a couple days dipping into the 60's. This means to start filling the boxes with damsel flies, both nymphs and dries, for your stillwater excursions. The June Fly-of-the-Month will be a very simple to tie, and quite effective, damsel nymph. I hope to have the tying instructions up by Wednesday of this week. Blitzen: 118 cfs as I write this, and a temperature of 65 degrees at 4:20 in the afternoon. It appears from the graph that while the water level is dropping each day, the daily "high" volume hits around 6 AM. Low temperatures have went up from the high 40's to 55 degrees over the past four days, with a steady increase in daytime high temperatures. Fish Lake: The road opened last week. No reports. Watch for snakes when in the area. I've already seen two rattlers on the road. And pack some good bug spray. And sunscreen. And water! 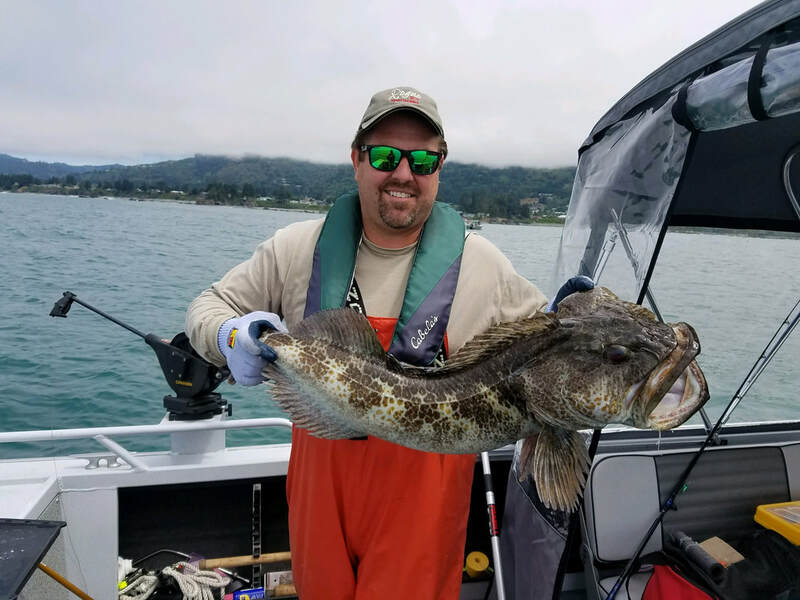 The strong winds the past week have hampered fishing efforts, although it appears that there should be a calm coming over the region starting Sunday. We can only hope! USFS Lakes/Reservoirs: It appears that the lakes and reservoirs in the forest have held over, with fish in the 14-18" range being caught, along with their smaller cousins. Smaller flies seem to be working best, such as traditional Hare's Ear, Pheasant Tails, and other nymphs in #14-16. There have been some good chironomid hatches, too, so be prepared. Chickahominy: Fish continue to be caught as weather allows, with fish being found in the deeper, 8-12' of water. I haven't seen how much it's dropped the past two weeks, or if algae has started, so be prepared for the possibility. Blitzen: The Blitzen did hit over 300 cfs this week, but is falling the past 24 hours as I write this, currently flowing at 172 cfs. If it keeps dropping, it should fish well on the fall. If it starts rising again, watch for days of little fluctuations or continual falling flows. I hoped to give a report on the water level at Chickahominy before last weekend, however, between being quite busy at the coastal property (and an hour or two of fishing! ), and not being able to access the site earlier this week, I wasn't able to keep my word. Apologies! I did stop in to look at the water both coming and going from the area, and it appears it's in fine shape. For those who may have thought what appears to be the high water level for the spring is substantially above the current level, it looks like it's pretty close to the same height as it was at ice out, as that visible high water line is from last year...and before. I think we are good for the spring until things "green up" in the early summer. I think... I am hearing that fish caught this last week continue to be plugged with leeches, beetles, and a few snails. Plan accordingly. The Blitzen is currently running at 120 cfs and holding fairly steady since hitting around 200 cfs a week ago. The weather today has been everything from snow and ice coated ground (and vehicles) this morning, winds in the 20-30 mph range with higher gusts, flurries, sprinkles and anything but warm spells. No "great" weather in view, for over a day at a time, for about a week. Spring in Harney County!! SO.....took my dad out to Chick Friday afternoon. The water has dropped this past week, and not sure why - maybe up to 2 feet...? It appears it dropped more this past week than previously from ice out. Very concerning, as we haven't had "evaporative" conditions. Still in good shape, clear, and fishing well when the weather permits!